Title: 04/01/1993 - Meeting labeling requirements of hazard communication standard for slag wool. This is in further response to your letter of December 1, to the Occupational Safety and Health Administration (OSHA) Area Director, John Hall. Your letter was forwarded to Federal OSHA's Office of Health Compliance Assistance for response. Your letter to John Hall requested clarification on the labeling requirements of the Hazard Communication Standard (HCS), 29 CFR 1910.1200. You indicated that a label is currently attached to bales of your slag wool, and this has caused problems when your customers process the slag wool. They have reported that the labels become "entrained" in the final product. Post a sign in areas where bales are accumulated and consumed. However, we disagree with the rational you offered for implementing them. The alternative labeling methods which you cited, 29 CFR 1910.1200 (f)(2) and (f)(6), do not apply to your unique situation. Paragraph (f)(2) discusses labeling requirements for solid metals, such as a steel beam or a metal casting, and does not apply to bales of slag wool. Paragraph (f)(6) also does not apply because it specifically addresses "stationary process containers." The alternative means of providing a hazard warning that you propose to implement is appropriate because bales do not meet the HCS's definition of a container. Even though the twine or wire that secure the bales are not containers as defined under the standard, and do not lend themselves to standard labeling methods, chemical hazards must still be conveyed. The purpose for labels under the Hazard Communication standard is clear. 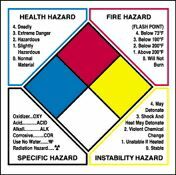 Labels provide an immediate warning of the hazards that employees may be exposed to and, through the chemical identity, labels provide a link to more detailed information available through MSDSs and other sources. Labels must contain the identity of the chemical, and appropriate hazard warning, and the name and address of the responsible party. Employers must ensure that the hazards of slag wool are presented to employees by alerting them to potential hazards before exposure could occur. The attached correspondence from Mr. Charles A. Jones of Sloss Industries Corporation was received by our Birmingham Area Office and forwarded to the Regional Office for reply. According to Mr. Jones' letter, the labels being attached to his company's product (slag wool) become entrained in downstream customer's processes. He is proposing the use of an alternate labeling system as described in his letter. In a telephone conversation with Mr. Jones on January 7, 1993, it was learned that he is very concerned about this problem and felt his alternative would be effective in communicating the hazards of his product per the Hazard Communication Standard. The questions posed in his request involve national issues and are forwarded for your response. Please reply directly to Mr. Jones with a copy to our office. If you have any questions, please contact Jim Drake of my staff at (404) 347-2281. This letter follows-up our telephone conversation on October 26, 1992 concerning an interpretation of the labeling requirements (paragraph f) under the Hazard Communication Standard (29 CFR 1910.1200). Sloss would like to utilize the alternate labeling system, as mentioned in subparts 2 and 6 of paragraph f. Sloss would utilize the system on our Slag Wool bales going to one customer. These bales are shipped via rail car. SafetyEmporium.com carries both serious and humorous signs. At this time the labels on our bales cause this customer to have process upsets. The labels become entrained in the process and cause off specification material to be produced. We have tried different alternatives but no satisfactory solution has been found. We are committed to proper labeling of our product, employee safety and health, and customer service. I feel the alternate labeling proposed will allow a solution that will satisfy everyone and compromise nothing. Currently, our customer consumes the bales and thus removes the labels as the first step before processing. The alternate labeling we are proposing would consist of the following: 1. Utilize signs (enlarge a current label) in our facility to convey the information to our employees (See Attachment I); 2. Post signs conveying information inside the rail cars which are used to ship these bales; 3. Transmit a label and a material safety data sheet with each shipment; 4. Post a sign in areas where bales are accumulated and consumed. We feel that this alternate labeling system is just as protective of employees and is allowed in the Hazard Communication Standard (See MSDS Attached). As we discussed earlier, Sloss would like to get documentation of OSHA's interpretation.